ABB Australia recently won orders worth $60 million for power projects to help the international mining group, Rio Tinto, at their iron-ore mines in the Pilbara region of north-west Western Australia. According to Saju Pothen, ABB Australia’s Project Engineer on the switching station, “Our initial requirement was for a prime power generator to power a range of site amenities that included a number of building huts, water pumps and ancillary equipment such as welding equipment. “The feedback on the Olympian generator sets has been positive, all providing a good standard of performance and reliability, so we were very comfortable to specify another one. “From our point of view, fuel efficiency, price, product support and reliability in harsh operating conditions were essential prerequisites - and in these areas Olympian generator sets have proven themselves time and again. “We briefed Cameron Sharp at Energy Power Systems Australia (EPSA) on our requirements and he came back with a number of recommendations based around the 50 kVA Olympian GEP50-5, which included a number of packaged and unpackaged options. “EPSA arranged all the engineering and then the subsequent shipment to the Seven Mile power station where the technicians from the local WesTrac branch performed the installation and commissioning – which is another tremendous strength of dealing with EPSA as they’ve got access to support throughout the country through the Australia-wide CAT dealer network. “From my point of view it’s important when working on projects like this that can be thousands of kilometres away to deal with suppliers who perform. “And that’s exactly what Cameron and the EPSA team did, keeping us up-to-date throughout the project with progress, while meeting every agreed deadline,” Saju said. Commenting on the Seven Mile power station project Energy Power Systems Australia’s Olympian National Business Manager, Kim Howlett, said that EPSA’s association with the Caterpillar dealer network was proving to be an influential factor with customers, as it provided the continuity of service and support. 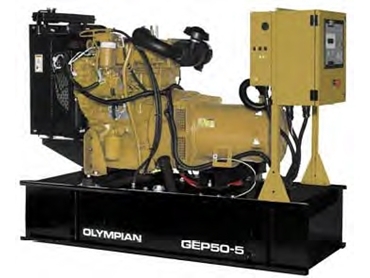 Olympian Generators represent a lower entry level product range that still boasts CAT’s legendary performance.